We call for the freedom of 121 immigrants and asylum seekers, from 16 different countries, who are being unjustly and inhumanely detained by Immigration and Customs Enforcement at the Federal Correctional Institution in Sheridan, Oregon. Tell ICE: Let Our People Go! Click the Button below for a sample script and phone numbers for the "Let Our People Go" calling campaign. On Tuesday, July 31st, clergy leaders and IMIrJ supporters prayed and walked to the ICE office in SW Portland, where we personally delivered a public letter asking for the immediate release of the people detained in Sheridan. In addition, we are asking faith communities throughout the state to participate in a massive calling campaign to the ICE offices throughout the month of August. An August of Action: "Let Our People Go"
Let Our People Go action at the ICE headquarters in Portland, OR. Three clergy were arrested in an act of civil disobedience, calling on ICE to Let Our People Go! A #LetOurPeopleGo caravan with representation from five counties in Oregon attempted to deliver our letter and message to ICE officials stationed at the federal prison in Sheridan, OR: Let Our People Go! When Christian pastors heard that Romans 13, a passage from their holy scriptures was being used by Attorney General Jeff Sessions to justify family separation they knew they needed to speak out and reclaim one of the core truths of Jesus’ teachings-- “only love fulfills the law.” These Christian pastors announced that they were moving their worship services to Sheridan and invited all to join. When the Sikh community heard about this, they responded and came, too, offering prayers, and serving a langar (community lunch) out of the depth of their tradition. A morning offering raised $4,275 for continued organizing alongside partners at Unidos Bridging Community in Yamhill County. People from different faiths, elected state officials, and people of good will were there, too. With only three days notice, almost 700 people came! It was a powerful morning. On Sunday, July 24th nearly 700 people gathered for Sunday Morning Worship service alongside the razor fence of the Federal Correctional Institution in Sheridan, Oregon, where 121 immigrants and asylum-seekers are being unjustly detained by Immigration and Customs Enforcement. 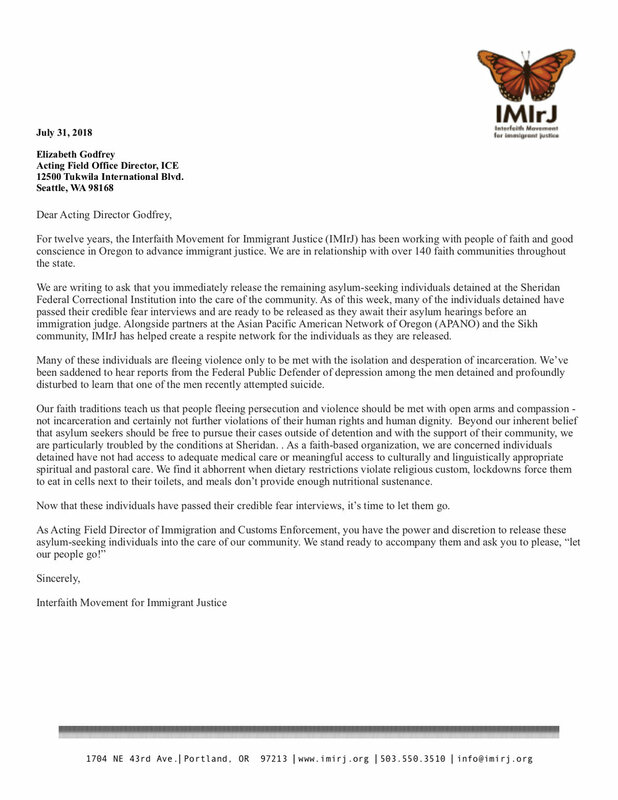 ... from the state of Oregon signed on to an open letter to ICE and FCI Sheridan, urging them to allow immigrants detained in the facility to access culturally and linguistically appropriate spiritual care and religious services ... and admonishing the present Administration's "zero-tolerance" policy. On Monday, June 18th, over 1200 people gathered outside the Sheridan Federal Correctional Institution for a vigil calling for an end to the separation of immigrant families, and justice for the 123 immigrants detained by ICE at the facility in Yamhill County, Oregon.